It has become a tradition that the children at St. Margaret’s choose which is going to be the Charity that we support each year. The process starts with a house meeting run by the House Captains. Each of the four houses then elects a charity to support and presents that to the school. The whole school eventually have a democratic vote to see which of the four nominated charities we will support throughout the year. 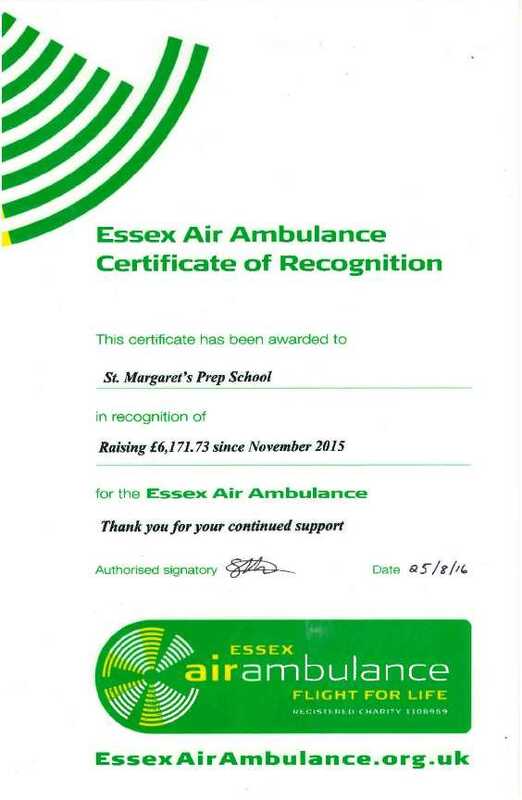 The Charity for 2015/2016 was Essex Air Ambulance. During the year we held a few events, culminating in our big ‘Charity Day’ in the Spring Term. We have added the total raised by the children through the year, especially the sum raised on their ‘read-a-thon’, to the amazing total their very generous parents gave at the charity auction at the Summer Ball, and are absolutely delighted to announce a spectacular grand total of £6,171.73! Thank you to everybody who donated or bid for goodies at the Ball. The children are now beginning the process of choosing the charity for this year…. watch this space!